Everything you need to know about Google Assistant. The rise of smart speakers hasn’t gone unnoticed. Where you first could choose from three pre-programmed commands, the possibilities are now endless. After reading this article, you’ll be able to explain to your neighbor what Google Assistant is and you will walk away with examples on how businesses can leverage the Google Assistant to create a better customer experience. Google Assistant is Google’s voice-controlled smart assistant. Once existing only in Star-Wars-like movies, voice-based artificial intelligence is now a reality. A.I. brought us to the point where you can listen to the news, check the weather, send an e-mail, and learn how to tie a bowtie by watching a video without even touching a device or lifting a finger in the first place. 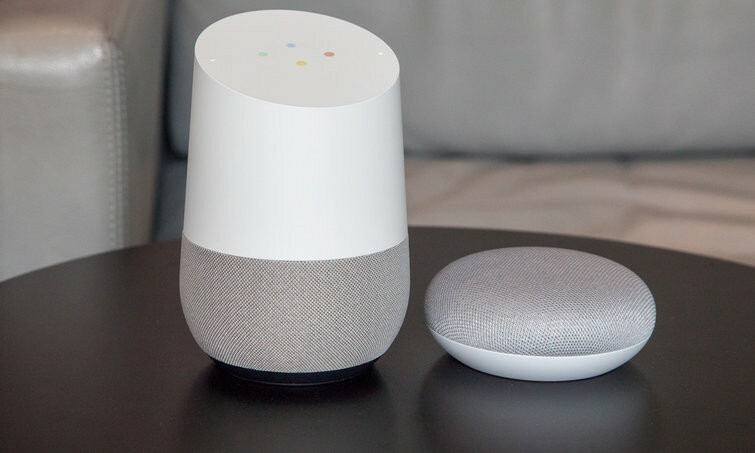 Google brought the Google Assistant alive through their hardware like the Google Home and its precursor the Google Home Mini. See them as transport for the assistant. Everybody calls it different and nobody knows exactly what it means. Computers that people can interact with simply by having a conversation. A form of interaction that goes back to the beginning of the human race. Conversational AI is the voice-driven technology like Google Assistant, Alexa and Siri to ask what the weather is going to be like, order food, clothes or other products, and even call a cab. Simply by using the form of communication that we’ve always known. Through a Voice User Interface, spoken human interaction with computers is made possible. VUI is what allows people to use voice input to control computers and devices. Basically, the brain behind all those devices that can be controlled using speech. How businesses can leverage the Google Assistant. Chatbots and Voice Assistants allow companies to deliver better customer experiences to their customers in places and platforms that consumers are already engaging in. Earlier we stated that in May 2018 there were more than 5,000 devices connected with Google Assistant. In 2018 during the annual Consumer Electronics Show (CES) in Las Vegas, both Amazon and Google discussed their plans to bring their respective voice assistant into all aspects of daily life. Think the way you commute, spend your leisure time, practice hobbies, manage the office and so-on. These implementations don’t even scratch the surface of what is possible but if you still have a hard time imagining what voice can do for your business, here are two use cases. Zia Voice, the conversational AI assistant for Zoho CRM. A CRM basically is a database but more often than not you want to skip the data and get to the point. Made for salespeople using Zoho CRM, From simple data, like call counts for the day or for complex calculations, all you have to do is ask. According to their website, a user can chat with Zia using the ‘Ask Zia’ button at the bottom of your desktop screen or call her on your mobile to get easy access to your information. Functionalities include making a chart from your CRM data, calling a customer, schedule a meeting, receive reminders to enrich an entry with additional information like notes or the exact date and time of a call. Lighthouse allows users to ask for information from their security cameras. For example, a user may wake up in the middle of the night, hearing a strange noise in another part of the house. They can then ask the camera if it’s an intruder, or simply another family member or pet. The AI technology learns to recognize frequent occupants of the house, so it can alert a user when someone inside the home shouldn’t be there. For more use cases by Starbucks, the Royal Bank of Canada and the United Services Automobile Association read this article: Voice — the next wave of time-saving technology. Voice assistants are growing in popularity and user adoption. We are seeïng a reality where businesses are fully optimized with and for voice technology. Ultimately, the value of AI is found in companies’ abilities to harness them. McKinsey’s paper on ways Artificial Intelligence can be used in different industries. Artificial intelligence can make delivery traffic more efficient, which can improve fuel use and reduce delivery times. In one case study, the report found that a European trucking company reduced fuel costs by 15 percent. Drivers used sensors that monitored both vehicle performance and driver behavior and received real-time coaching on when to speed up or slow down. It can predict congestion and weather-related problems, which can help airlines avoid costly cancellations. Taking advantage of AI can help with a business’ supply chain. For instance, with pharmaceutical and medical products, AI could use real-time data to predict regional demand and health trends can help companies determine how much they should have in their inventory. AI could help with “next product to buy” recommendations, similar to what Amazon and Netflix have successfully implemented. In auto insurance, for example, premiums could be based on data about driving patterns and distances driven. In one case, a travel company offered additional services such as hotels and airlines using an algorithm trained on product and customer data. Pharmaceutical companies are using AI to reduce risk in clinical trials, and mining companies have used technology to anticipate any disruptions to their production. We’ve received many requests of companies who are eager to see what voice can do for them. Varying from retail to education, all with the goal to create friction-less experiences for the people they wish to serve. Is 2019 the year where the business world is massively going to adopt voice?